Despite the worries regarding the dramatic time-zone shift coming into these Winter Games (PyeongChang is a full 14 hours ahead of the Eastern time zone), NBC Olympics in the U.S. has blown its streaming numbers out of the water. For the PyeongChang Winter Olympics, NBCOlympics.com and the NBC Sports app have already tripled the number of live-streamed events it logged at the 2014 Sochi Games. In numbers reported by NBC Sports (which it attributes to Adobe Analytics), viewers logged a whopping 1.31 billion live-streaming minutes on NBCOlympics.com and through the NBC Sports app as of Feb. 18. That number triples the same metric from the whole 2014 Sochi Winter Olympics — with more than a week to spare. In addition, there were 11.6 million unique views as of the same date, up 174% from Sochi (4.3 million). Things are going well. But, outside of the natural growth in usership of authenticated live-streaming apps over the past four years, what’s the deal? In the eyes of execs at NBC Olympics, the key reason for the explosion in digital viewers is connected TV. Devices like Apple TV, Roku, and Amazon Fire — none of which, mind you, even existed during the previous Winter Games — are providing an easy-to-navigate environment and a lean-back experience on one’s home television screen. 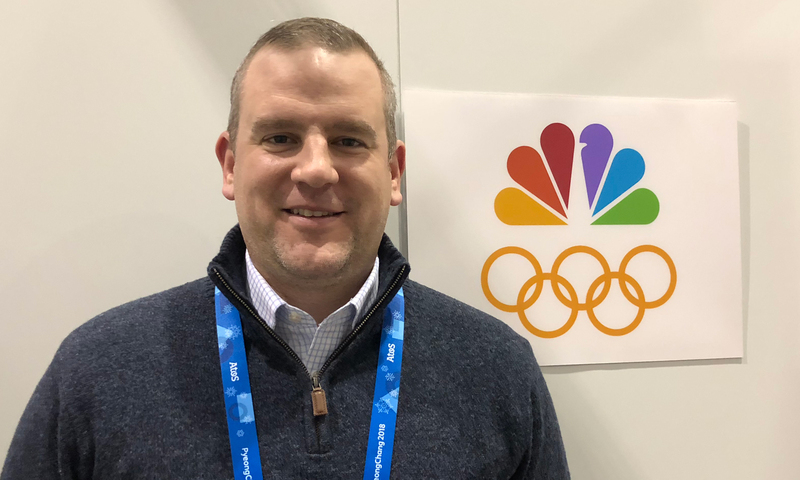 NBC Sports Group’s Rick Cordella says use of connected-TV devices has been a boon to this Olympics’ streaming numbers. Cordella notes that the app experience on a phone or laptop is great for viewing on the go but tends to deliver shorter use times. Through the connected-TV devices, users are more likely to throw an event on their big screen and consume content for longer stretches. For all of its international rightsholding broadcasters, host broadcaster Olympic Broadcasting Services (OBS) produces a white-label version of a live-streaming app that can be taken and directly delivered to consumers. Major broadcasters like NBC Sports, however, choose instead to take OBS’s package of APIs (application-programming interfaces) and SDKs (software-development kits) in order to plug the live-streaming video and event data directly into its own existing app. The obvious benefit is that many viewers may already have the NBC Sports app on their device and the network wins with the branding and exposure that comes with pushing new users to a primary app. Plus, it takes a major effort to get a user to download a new app for a two-week event, and then, with a one-off white-label app, the broadcaster loses all of that valuable user data when the event is over. 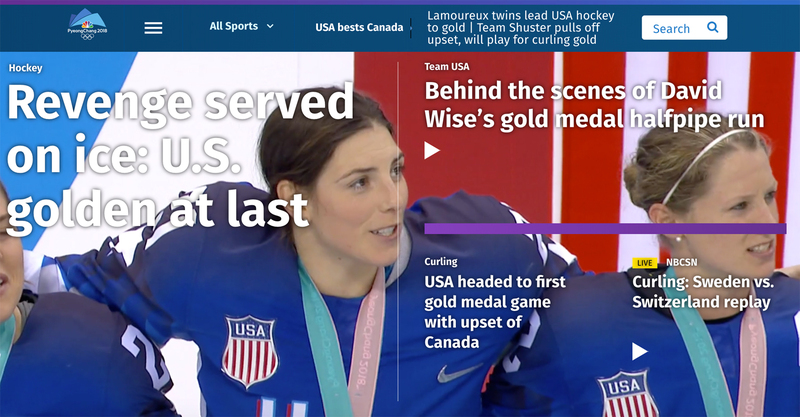 On the backend, NBC Olympics’ live-streaming experience is a product of NBC Sports’ Playmaker Media and its technology partner iStreamPlanet. More than 75 staffers work through the night at NBC Sports’ facility in Stamford, CT, to support and QC the technology of the live-streaming product. Plus, the Olympics aren’t happening in a silo for NBC Sports. Its other properties — including the NFL, NHL, and Premier League — continue to test the infrastructure’s capabilities on a nightly basis. Users may have noticed a few enhancements to this Olympics’ streaming experience. NBC Sports is calling it “Enhanced Viewing Experience” because the network leverages its archived media assets and data feeds coming in from OBS to provide a more informative and interactive UI. During the primetime show, viewers are welcomed with a slate of information, including a rundown of the events and athletes to be featured that night. ChyronHego Lyric Pro graphics-creation software is used to create and insert the dynamic, reactive “cards.” For example, during a live figure-skating stream, users would be able to access “cards” with data like the upcoming order of skaters, medal counts, and individual skater info with video highlights. NBC Sports is also using chapter markers (available on most platforms) on the live-streaming timeline to make the navigation of longform/live content simpler for users. With a graphic-interface point, viewers can easily track back to the start of a race or identify where a favorite athlete’s run took place in the stream. NBC Digital is also using a Blackmagic Design switcher to offer access to bonus camera angles — on such spots as the warmup room, the coach’s box, or the “kiss and cry” — at appropriate times. Jason Dachman contributed to this report.